Drove by a vehicle on 23rd Street on Saturday and noticed some writing on the windows. Turns out that owner is not happy with Bennett Motors and wants to tell everyone about it. Please note that I do not know who owns the vehicle, I don’t know anything about what happened, and I have never dealt with Bennett Motors. I present these pictures only because it is rare for someone to air their complaint in such a manner. Wonder if any of the folks over at Bennett Motors have seen the writing on the windows? “As Is” with “No Warranty” comes to mind here. That’s the trouble with used cars. I won’t be taking up for Bennett Motors, because they can carry their own pretty well. I will say that they have a better product than Pierce. I thought that maybe a check of the oil and the water once in a while might have saved this guy from embarrassing himself with regard to his poor spelling skills. I made a similar note on the photos when Dave posted them. 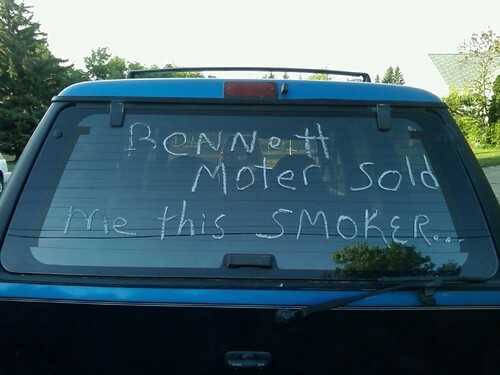 I have personally not had any problems with Bennett Motors. K’s Auto Sales is the best place to get a great deal on a previously owned vehicle. I got my van there and not a single problem. I don’t know anything about any of the other dealers except that they could not have made the deal I got. Jared/Todd- email me please! I need two used cars for my kids! Pingback: Bleskin Motors Query | Greater Falls!